Hi, and welcome to the Leadership Done Right YouTube Channel. There’s a common saying that, “You learn something new everyday.” Many people say that as if it is a proven fact and it is inevitable. However, I believe that learning only takes place if you proactively choose to learn. There are people in the world that fail at the same thing over and over again and yet they approach everything exactly same each time. They are not learning from their experience when they are repeating it over and over and not changing their actions. Sure, everyone goes through a new experience everyday, but does that mean that they are learning everyday? Not necessarily. To learn something new everyday, it’s important to actively seek learning by study and by faith. There are many ways that you can learn. You can learn from organized education, an online course, audiobooks, or by other means. Regardless of how you seek learning, it’s important to study and have the faith to practice what you are learning. For example, if you’re going through a math class, do everything you can to learn by studying the material and have faith in yourself that you can learn it. Also, have faith that what you are learning is practical and will be useful in your life. Having faith that what you are learning, in any aspect, can be put it into action, will help you to learn more in the future. Now, let’s look at how or where you can begin your learning. So, how can you begin your learning? Well, l like to use these three methods to learn something new each day. 1. Learn from the best books/literature. There are so many books, as well as, other forms of literature in the world today. Some are high quality, while others are not worth your time. It is very important to spend your time and energy learning from the best books and forms of literature. As a leader, your time is extremely valuable. 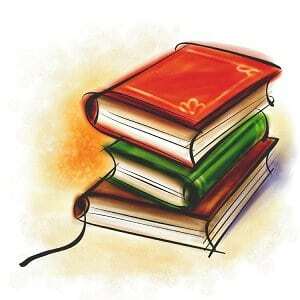 Find the books that give you the most value for your time and don’t be afraid to stop reading a book if it is not worth your time. If you want a good list of books, check out my list of recommended books. There are also many other forms of literature that exist including blogs, newspapers, magazines, and review journals to name a few. These are good sources of information and learning, but just as with books, you shouldn’t be afraid to stop reading if something is not worth your time. In addition to books, you have interactions with people on a regular basis. Each person has a different perspective on life and how things work together. Take each interaction you have as an opportunity to learn whether it be a teacher, doctor, coach, employee, boss, coworker, family member, supermarket cashier, or any other person you come in contact with. I had a great learning experience recently, when I spoke to my friend Patrick Casanova on the Leadership Done Right Podcast, episode 22. He explained a situation where he was at work and received a phone call from his kids. The call turned into a yelling match with his kids yelling at each other, so he in turn began to yell at them. Within a few days of that call he overheard one of his employees having a yelling match on the phone. As he was about to reprimand his employee for yelling, he realized that his example had given them permission to yell on the phone. That situation really resonated with me because it shows a clear example of how others observe and mimic you more than you realize. Each person has had a different experience in life that can give you insight on how to live your life as a leader. There are so many lessons we can learn from the people around us. We just need to take a moment to listen and understand. In addition to the people we come in contact with, we also make many choices on a regular basis. Some of those choices are good and some are not. Take time each day to reflect on the choices you’ve made and the lessons you can learn. Also, reflect on how your choices affect others. As you reflect, identify what you can do better or differently in the future so the outcome is more desirable. In addition to looking at what didn’t go as planned, reflect on what went well and why it went well so that you can duplicate that in the future. By taking these three actions to learn something new each day, I promise you that not a day will go by that you will not learn something new that is valuable. I’d like to finish off with a few viewer questions. 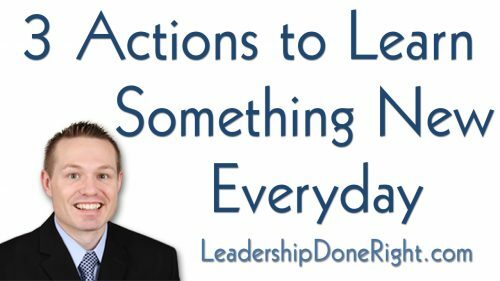 How have these three actions helped you to learn something new each day? What daily habits have you created to make time for learning? Please share your thoughts in the comments section below! Well, thanks for watching this video. If you enjoyed it and would like to watch more great videos just like it, please subscribe to the Leadership Done Right YouTube Channel and check out LeadershipDoneRight.com. Also, please like the video and share it with others! Until next time, go and be the best leader you can be!